The stunning photography of Michael R Hewett depicts 42 years of dedicated effort by a gifted photographer to capture the most scenic and alluring Grand Prix in the world. On the 3rd of June 1962, Michael stood at Monaco station in the evening sunshine after photographing his first Grand Prix and wondered if he would return to the magical race. The allure of this prestigious event has held him ever since and he has not missed a Monaco Grand Prix since. 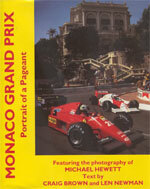 His work has been widely published in motor racing annuals and magazines and in 1989, he published his first book, MONACO GRAND PRIX - Portrait of a Pageant. Rated as third best book of the year by the Armchair Enthusiast it depicts Michael’s personal selection from archives and his work up to 1988. Pictures were chosen not only on technical merit, but the memories and emotions provoked by the photographic challenge and the race itself. (The last few copies of the book are available as an exclusive offer on this website). 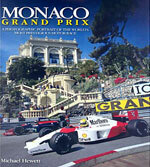 Michael has since completed his second publication, Monaco Grand Prix, that was released in May 2007. The Monaco Grand Prix, meticulously captured through the lens of Michael Hewett, is now available through this website. The best of the last twenty years is currently available exclusively through this site. Michael has also captured some of the most beautiful places on earth in a unique selection of landscapes. Please link to Landscapes to view and order from this selection.